May 10, 2013 – at daylight. We got five hours of sleep after the long run the day before. It was the sleep of the exhausted. This is our last day of voyaging on the Pacific Ocean. Once this day is over, we will relax. No more early get ups. Night voyages and mid-watch standing are over. It was calm when we got underway – along with the commercial fishermen. They were in a big hurry to get out to the fishing grounds. We were happy to let them go by. We left on the ebb, but with flat seas it was a smooth transit to the Pacific Ocean. We turned right – to the north. Once we were on our way – with something in everyone’s tummies, I went back to my bunk. It was calling me – and I answered. Apparently, our crew guy went back to his bunk. He must have gotten the same call. After a few more hours of sleep, feeling refreshed – and guilty, I went topside to find Captain navigating in light fog. Apparently, the fog came on us, shortly after we got underway. While I slept he kept busy dodging crab traps in the fog. After Captain and I breakfasted, he went below for a well deserved nap, and I went on watch. Fortunately, for me, the crab traps were well behind us by the time I came on watch. The fog had lifted, and we no longer needed radar to show us the way. It was a good watch. We passed Destruction Island. I know I took pictures of this island every time we went by – and that is many times, but I can’t find a picture. Most likely, those are the ones that are blurry. It’s a long skinny island, so they are taken from a distance., and it loses something in the translation. 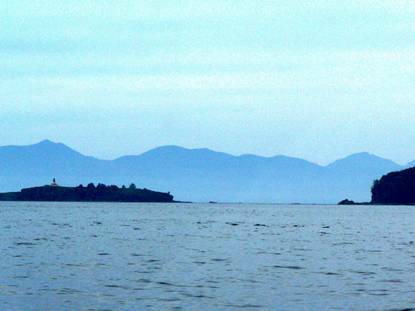 Another landmark on the west coast of Washington is the Umatilla reef. 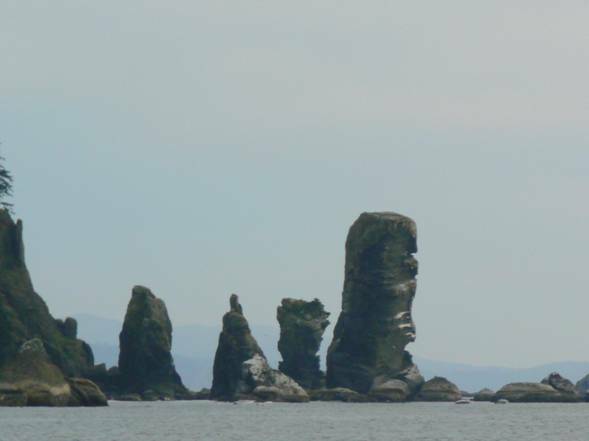 I love their different shapes and wonder how long they’ve stood there, being whipped into shape by the winds and water of the north Pacific Ocean. These are some of the most visible rocks. Believe me, there are plenty that lie below the surface. Boater beware! This day was the opposite of yesterday. No up-down-splash, no swish this way, swish that way…it was calm – flat and perfect conditions for the final day of our voyage on the ocean. Very fitting, I thought! Tatoosh Island is to the left, Hole in the Wall is in the middle, and Cape Flattery to the right. 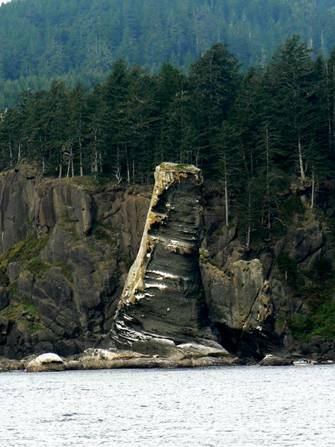 Many boaters fear Hole in the Wall, and go out around Tatoosh Island – way around the island. It can add hours to the trip, depending on the speed of the boat. It is safe to pass between the island and the mainland – we’ve done it many times. We do plan our arrival and transit in daylight. (We would go out around the west side of the island if it were dark.) It’s a beautiful transit, and gets us around the Cape (Our last cape!) in short time. Tatoosh Island is a bird rookery. Depending on the time and season, thousands of birds nest there. It seemed to be mostly gulls this time. 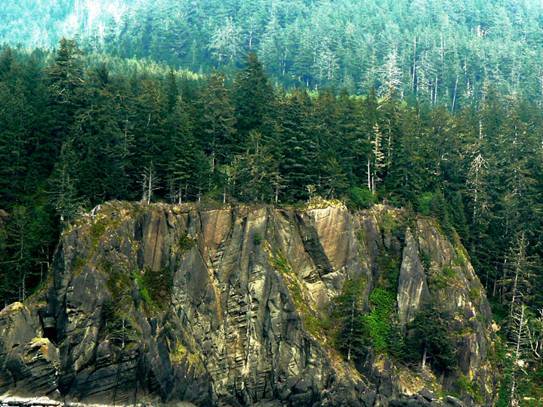 This part of the coast is just south of Cape Flattery. The scenery is stunning. Few people get to see it from our vantage point. I’m grateful I got to see it. I will always cherish this area and the memories it evokes. It signified the ending of a voyage – or the beginning – for many years. Pillar Rock is just south of Cape Flattery. Once we got through Hole in the Wall and on to the Strait of Juan de Fuca, our voyage wasn’t over – it just felt that way. We still had an hour to go before we entered Neah Bay. 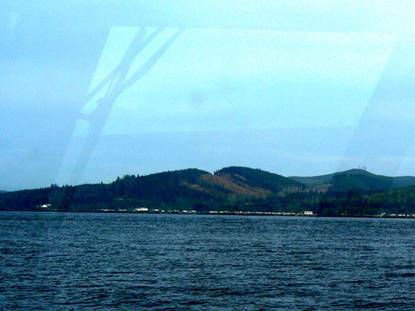 Neah Bay is a rest stop for boaters coming from, or waiting, to go south. It is a very protected bay, and we enjoy hanging on the hook there. When we woke up this morning there were over a dozen eagles on the beach. It was low tide and they were all feeding. Many of them were immature – no white heads, but several were mature enough to have white heads – maybe parents? They were too distant to get decent photos, but it was fun to watch with our binoculars. The eagles sent us a message – You have arrived in the Pacific NW! So, let’s all breathe a big sigh of relief – aaaahhhhh. We know we are back! Back to the Pacific Northwest – where we call home. And you know what? It felt like home. Our voyage is done. Though we planned to hang out and sleep for a couple days in Neah Bay, weather made the decision and after a nice long rest and a late getup, we got underway for one last day of voyaging. After a whopping seven plus hours we arrived in Port Angeles, WA. And really, this is when we know we have arrived. Long days of cruising are done. We may get up early – to catch a tide or beat the wind – but long voyages are done for now. What, pray tell, have we been doing since May 11? Resting, recovering, and relaxing. We moved three times, for a total of less than eleven engine hours. As I put the final period to this blog, Captain is driving our car up to the PNW. When he gets back to me and DV, we will truly be home – in the PNW! 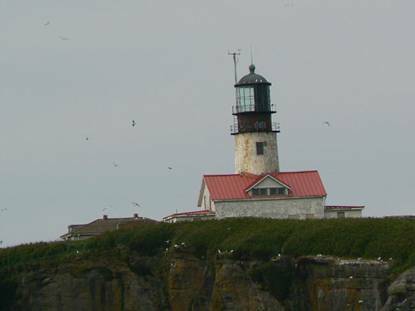 This entry was posted in 2013, Cruising, Photography, Voyages and tagged Baby boomers, Bald Eagles, Boating, Cape Flattery, Coastal Cruising, Destruction Island, M/V DESERT VENTURE, Port Angeles Washington, Strait of Juan de Fuca, Tatoosh Island, Tatoosh Island Washington, Travel Writing, Voyaging by Angela. Bookmark the permalink. The pictures are gorgeous, as usual! So glad you are home and safe but we hope we’ll still be able to get together in P.V.! Or anywhere else!! It was wonderful to meet you at the Waterfront Festival, I have the 4 year old twin boys. You both have been in my thoughts lately. Keep in touch. Thanks, Courtney! We enjoyed visiting with you and your family. Thanks very much. A very nice collection of photos and ‘word pictures’. You capture very well, the mood and feeling. I feel like I was on board. Hooray!! Looking forward to seeing you this summer. On the water. On the land. Wherever we meet, it will be great!